Add A Touch of Elegance To Your Garden! - A classic and timeless look that effectively embellishes your garden. - 65 Inches tall minus 11 inches in the ground. 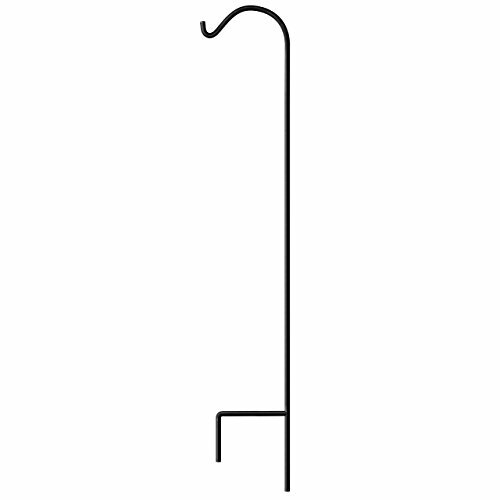 - With a dark finish, this hook complements anything that you decide to hang on it. - Premium quality metal, thin yet sturdy, rust resistant and durable. Heavy duty 1/2 inch diameter pole can support your heaviest bird house or flower basket. STYLISH: Traditional look and dark finish adds elegance and beauty to your garden. Stunningly complements anything that hangs from it. With a 1/2 inch diameter pole that is thicker than similar hooks from other brands, you can be confident you're getting the strongest shepherd's crook on the market! Double forked and extra-long base prongs at the foot of the rod maintain a fixed, upright posture while remaining firmly planted in the ground. Stands 65 inches tall, 54 inches long above the floor.